Bass technique is an ADA approved technique where the stress is put on all the areas including the gingiva(gums) and the tooth area adjacent to it. And so, the food debris, plaque that gets accumulated in that region can be cleaned well. This technique is popular mentioned when patients ask for sulcular cleaning techniques. As plaque accumulation is seen first on the cervical areas, the dental caries(decay) occurrence is seen first in those areas. So cleaning that part is really essential, as one of the preventive measures of dental problems. To perform the toothbrushing with this technique, a normal toothbrush can be used, but if its available, you can use ADA approved HydraBrush to clean the teeth. What surfaces are cleaned with this technique? > Place the head of the soft brush parallel to the occlusal plane, and the brush head has to cover 3-4 teeth, and start with the most distal(molars first) teeth. 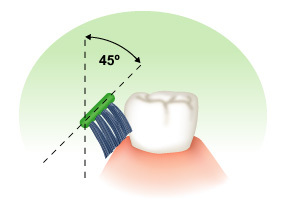 > Place the bristles of the brush at the gingival margin, and the angle of the brush has to be at 45-degree to the long axis of the tooth. > Using slight pressure, give vibratory movement with short, back-and-forth motions, but keep in mind not to dislodge the bristles. They should be intact on the surface of the teeth and gingiva. With this motion, the bristles of the tooth are forced down into the sulcus area and into the interproximal areas between the 2 adjacent teeth. This pressure should be enough to blanch the gingiva. > The strokes in that place concentrates on cleaning of apical third of clinical crowns, the gingival sulci, and into the proximal surfaces upto the reach of the bristles. After a few strokes, lift the brush and move to the adjacent teeth, and repeat the process for the next 3-4 teeth anterior to the ones you just did. > After you complete the surface towards the outer side(buccal surface), continue to do the same with lingual surfaces, and perform the same technique on the mandible. Don’t use high pressure to vibrate the gingival area, as it can damage the gingival area, and bleeding can occur. Use a soft bristle toothbrush rather than a hard one, as the softer one can go well deep into the interproximal areas. If you have a pretty large toothbrush, and trying to use it flat on the lingual sides of anterior teeth, its better to use it vertically than horizontally to access these areas. Have patience, as this method is a bit time taking, but is beneficial. For a few days initially, the gingiva would give burning sensation when you are using this technique, but that would gradually decrease when you develop a habit of this method of toothbrushing. This is a very good article about tooth brushing. Bass technique of toothbrushing is amazing technique to clean properly our tooth. It is really very good technique. Thanks for sharing with us. We recommend the BASS technique to everyone. This has to be the number one way to brush, and most don’t know about it! When your teeth are concerned don’t fool around… Get your teeth in to see the dentist. I prefer the SOLO technique, but this one is also good.